When you are in the market for a robust and highly useful stainless steel eye-jaw swivel fitting, then why not go for one on our website here at Rope Services Direct. These swivel fittings incorporate an eye on one side and a jaw type fitting on the other to enable the fitting of different ropes etc. The central swivel point allows each end to rotate individually and positioned accordingly. Integrated into our excellent choice of swivel fittings, eye-jaw swivels are perfect when using with our yacht rope to repair or replace rigging which is past its best, or when fashioning a balustrade for projects in the sailing, commercial and leisure sectors. Made of outstandingly durable 316 marine stainless steel, they will never break down or rust or tarnish, regardless of being used in the roughest of outdoor conditions. With widths on offer to fit between 5mm and 19mm, there’s bound to be the size you want. The key thing to check meticulously that you’re selecting the correct diameter of fibre rope or wire rope to sit comfortably within the eye. RSD is excited to be able to source all sorts of eye-jaw swivel attachments in a broad variety of sizes and styles – all from our large Midlands warehouse. 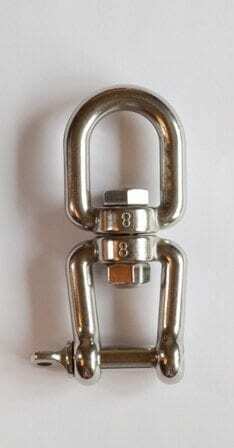 Whether it’s for boat rigging repairs or anything else, these swivels could well be just what you need. 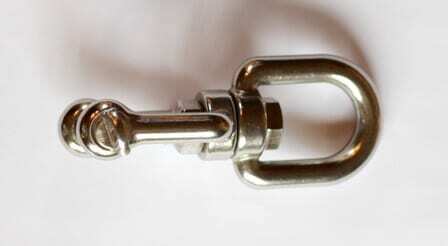 To send us your eye / jaw swivel(s) order, just send back our quick online form here. If you would like to chat to us today or put forward a question, just call us on 01384 78004 and we’ll be pleased to be of assistance. 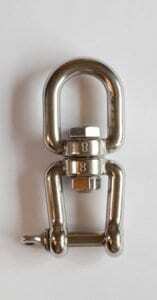 Eye-Jaw Swivel Fitting Overall rating: 5 out of 5 based on 6 reviews.